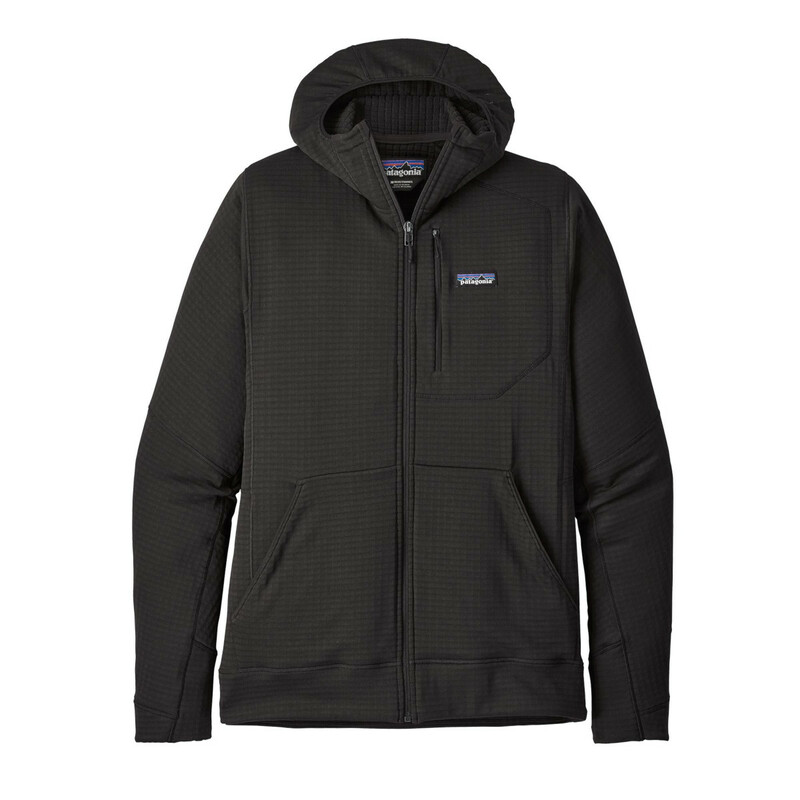 The Full Zip version of the Patagonia R1 Hoody, made from super-lightweight Polartec Power Grid fleece. Versatile, adaptable and comfortable, as well as highly stretchy, breathable and warm. A lightweight fleece that works perfectly as part of a layering system for climbing, skiing, hiking or mountaineering, but is versatile enough to be worn on its own in warmer climates. Featuring a full length zip, a slim fit and an almost balaclava-like helmet compatible hood, it’ll do a great job at keeping you warm, dry and protected, with the added bonus of Polygiene Permanent Odour control to stop it stinking after a hard day's work. Polartec Power Grid utilises a patented grid structure to create super-warm base layers with reduced weight and bulk, allowing you to work harder and sweat less. The grid structure increases the thermal properties of the fabric by creating air channels that efficiently disperse and redistribute moisture build-up quicker than any other fabric. Polygiene Odour Control is an antibacterial fabric coating used in Patagonia’s base-layers, made from recycled silver products. Its antibacterial properties stop your base-layers from smelling, meaning you can wear them for longer and wash them less, which gives the planet a little helping hand, too. Polygiene is a large-particle substance so it can’t be absorbed by your skin, and doesn’t mess with your body’s natural sweat system. Plus, it’s permanent, so its performance won’t decrease over time, and its antibacterial properties, combined with less washing, mean that Polygiene-treated products last longer. Bluesign is an international standard for fabric production which ensures that stringent environmental, safety, and efficiency standards are met by any fabric bearing its logo. Bluesign fabrics use fewer chemicals, less water, safer processes, and highly efficient manufacturing techniques to ensure that the creation of your new jacket, rope, or backpack doesn’t destroy the world you use it in.